The forward, who is the subject of trade rumors, continues his revival with a goal to spark the top line as the Rangers win their second straight and Henrik Lundqvist reaches another milestone. If the Rangers are going to keep the rest of this season interesting, these are the kinds of games they will have to win. Playing their final home game before the All-Star break, they beat the rebuilding Chicago Blackhawks, 4-3, on Thursday night at Madison Square Garden. The victory, their second straight and third in the last four games, lifted the Rangers back to NHL .500 at 20-20-7 (47 points). They will play their final game before the break on Saturday night in Boston. Henrik Lundqvist made 24 saves to earn his second straight victory and the 445th of his career, which moved him into a tie for sixth with Terry Sawchuk in NHL history. 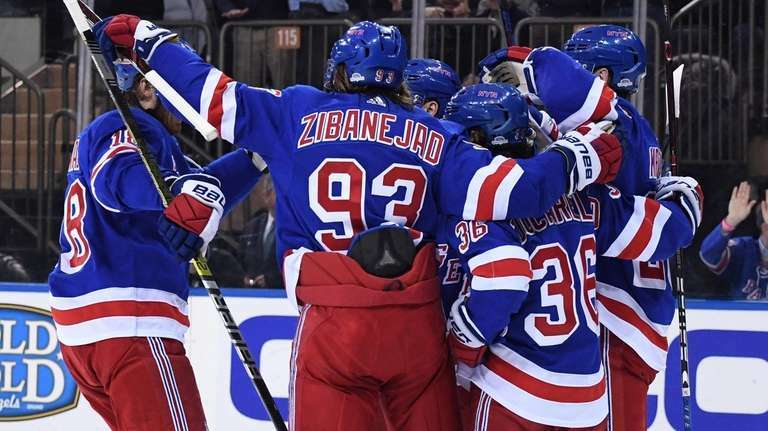 Filip Chytil, Mats Zuccarello, Chris Kreider and Mika Zibanejad (into an empty net) scored for the Rangers. After Zuccarello had three assists in Tuesday’s 6-2 win over Carolina, Rangers coach David Quinn said he was playing his best hockey of the season, and the right wing seemed to be more at ease after talking to several people in the organization about his personal situation. He continued his electric play against the Blackhawks, and even though he had only one goal, he made good things happen for the Rangers. Zuccarello, 31, has been a fan favorite since he joined the team as an undrafted free agent in 2010. But given that he is in the final year of his contract and the Rangers are in rebuilding mode, everyone knows he almost certainly will be traded before the Feb. 25 deadline. On the Rangers’ recent western trip, Zuccarello told the New York Post that his situation had been weighing on him. After that, Quinn said he and general manager Jeff Gorton spoke with Zuccarello. Although Quinn said his situation hasn’t been resolved, he seems to be playing with a freer mind. With the score tied 1-1 after a power-play goal by Chicago’s Brandon Saad and a pretty end-to-end rush by Chytil, Zuccarello put the Rangers ahead when he crashed the net and got behind Chicago goalie Collin Delia to jam in the rebound of Kreider’s shot at 17:38 of the first period. Zuccarello then fed Zibanejad for a pretty goal that would have made it 3-1 at 6:57 of the second period, but the goal was overturned after a challenge by the Blackhawks because of an offside. When the Rangers did go ahead 3-1 on Kreider’s goal at 13:09 of the second period, it was Zuccarello who set up the play by carrying the puck into the slot area, though he lost the puck before Kreider whacked it in. Zuccarello was not credited with an assist.